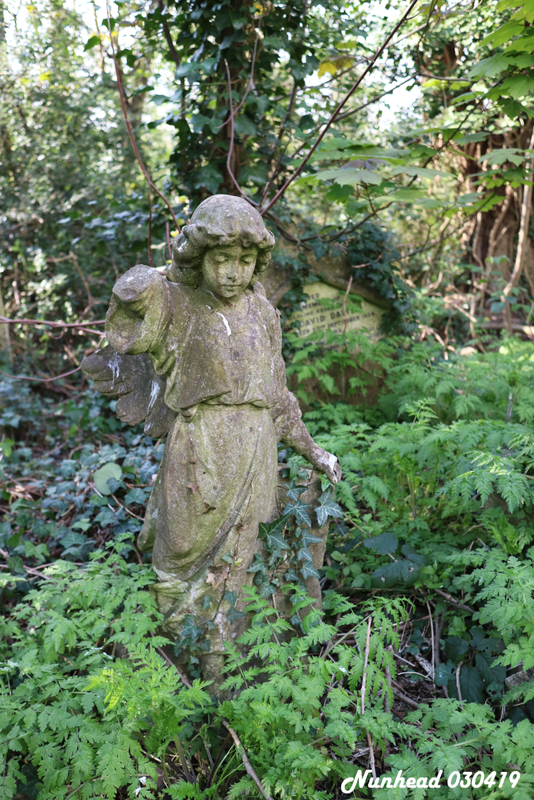 When I in 2006 for the first time visited Highgate Cemetery in London, I got amazed at the beauty of the old overgrown Victorian burial ground. Already at that time, Highgate West could only be visited on a guided tour, and the tour was an excellent introduction to the symbolism in the monuments and the importance of public grief in Victorian society. Highgate, as all of the other seven, fell into financial trouble in the 20th century and suffered decades of neglect at the mercy of vandals. Highgate also had its share of unwanted visitors hunting for a vampire, said to dwell in the cemetery. Nature has taken over in all of the Magnificent Seven, and I like symbolism of new life growing on these monuments of long forgotten grief. Reading more about Highgate, I learned that it was one of a group of Victorian cemeteries known as the Magnificent Seven, all founded between 1833 and 1841 on what then was outskirts of London, administered by private cemetery companies and serving mainly the upper middle class and the rich. Below is the Circle of Lebanon, catacombs built in a circle around a giant Lebanon Cedar three at a time when everything around Egypt was high fashion. Highgate featured in Tracy Chevalier’s great novel “Falling angels”. On my next trip to London, in 2007, I visited Brompton, which for most tourists is the easiest to visit, being most centrally located of the seven. As all the others except Highgate West, the cemetery has free access. While not being as beautiful as Highgate, it still gave me the thought to continue visiting the rest of the cemeteries during upcoming London visits. Brompton also featured in one of the new Sherlock Holmes movies. The next opportunity came in 2011, when I took extensive walks visiting Norwood and Kensal Green. Both these are very interesting mainly due to their large mausoleums and some prominent burials. In 2014, on a business trip, I had time to visit Tower Hamlets, which was severely damaged in WWII bombings and now is a nature reserve. It makes a nice surrounding for a walk, but has a bit less interesting grave monuments than the others. In 2019 I had a new business trip and got the time to visit Abney Park on the first evening and Nunhead on the third evening. Both are very interesting. Nunhead surprised me with the beauty of its location on a hill overlooking London city. You have a view down to St Pauls and London Eye, situated some 4 miles away. Any of these cemeteries are certainly worth a visit. If you visit only one, a guided tour of Highgate is strongly recommended. If you have less time, try Brompton, a short walk from Earl’s Court. All the cemeteries are maintained by local trusts.